Ofer Park Petah Tikva is in a very central location with easy access particularly for those approaching from Tel Aviv and from the South: there is a special exit from Route 4 Geha). 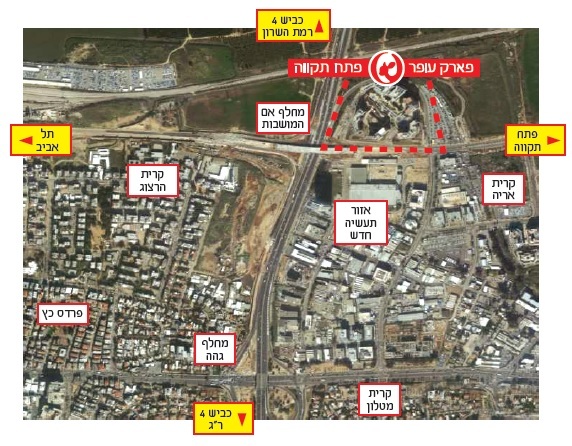 For those coming from the north – there) is a connection from route 5 to Derech Em Hamoshavot close to Highway 6. As part of the national planning of the light rail work is now being carried out to complete the Petah Tikva terminal, which will be located in Kiryat Aryeh, a very short distance from Ofer Park Petah Tikva. © Copyright Park Ofer Petah Tikva Ltd.